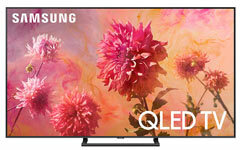 Samsung Q6 Vs. Q7 Vs. Q8 Vs. Q9 QLED TVs: Samsung introduces 4 QLED (Quantum Dot) 4K TVs for 2018. Quantum Dot technology gives you a more realistic, brighter picture with colors that pop. Combined with HDR technology these are the best TVs that Samsung has ever produced, even rivaling OLED. 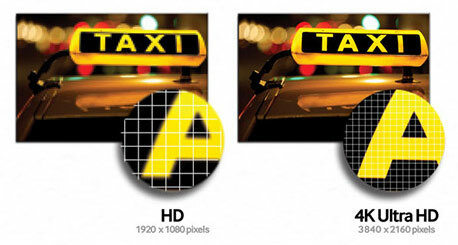 High Dynamic Range (HDR) gives you a wider range from bright to dark, simulating real life. All of these TVs are 4K Ultra HD, the same resolution as your movie theater. The Q6 & Q7 Series have edge lit backlights, while the Q8 & Q9 Series have premium Full-Array LED Backlights. For 2018, these models also go by models Q6FN, Q7FN, Q8FN, and Q9FN. Compare features and differences in the comparison grid chart below. 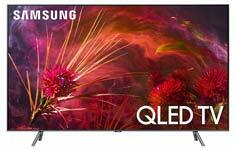 Samsung QLED Vs. OLED: Samsung QLED TVs are catching up with OLED TVs in picture quality. Samsung QLED TVs are brighter than OLED and give a superior picture for HDR enabled programming. OLED still is superior in black levels, but the 2018 models have greatly improved black levels. In bright rooms, or rooms with lights on, the Samsung QLED is better. OLED still has an edge in response time and viewing angles, but Samsung’s high end QLED TVs are closing the gap. 4K Ultra HD (UHD) = 4K is the new standard in TVs. It has 8 megapixels of resolution, which is 4X the Resolution of Full HD 1080p TVs currently on the market. This allows you to sit closer to the TVs as the pixels are smaller, and will give you a more immersive movie theater type of experience. 4K TVs also give you richer and more natural colors (especially Samsung’s newest QLED Quantum Dot TVs). High Dynamic Range (HDR) = Samsung is going all in with HDR, which gives you brighter picture with colors that pop, and better picture when there is a lot of bright and dark areas on the picture. All 2018 4K models on this page are equipped able to take advantage of 4K HDR which will be available on 4K bluray discs and other sources. All provide the HDR 10 format support, which is one of the standards in the industry. 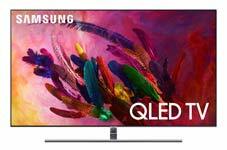 QLED (Quantum Dots) = New for 2018, Samsung introduces its QLED Line (Q6FN Q7FN, Q8FN, and Q9FN). 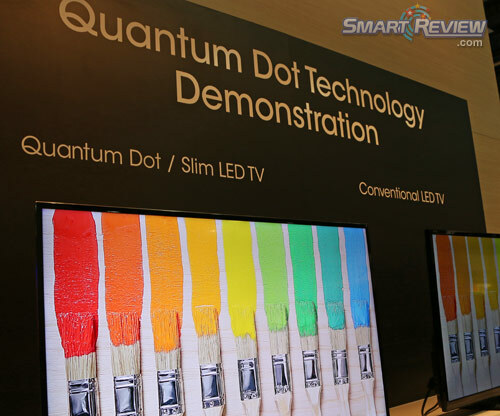 QLED is an advanced form of quantum dots). This technology will give a brighter picture with a much wider range of colors when compared to normal TVs. It also will provide deeper blacks. This is reserved for Samsung Top of line LED TVs. Q8 and Q9 Full Array Local Dimming = Only the Q8 and the Q9 models have full array led backlights and local dimming. This backlight system is superior to edge lit TVs, with more uniform picture and a higher number of local dimming zones for best picture, especially when using HDR. Nits Brightness = Nits is a measurement of brightness. 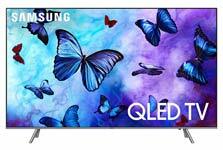 The new QLED TVs are capable of 1,000 nits ( Q6 model), and 1,500 nits (Q7, Q8, Q9 Series). The higher the Nits, the more realistic the picture quality when utilizing HDR technology. This brightness in the QLED TVs far exceeds the brightness of older technology screens. Ultra Black Elite = This is a feature that reduces reflections when you are watching your TV with lights on. Most people watch their TVs with the lights on. Reflected light from windows can also be reduced with this feature. The Ultra Black Technology is only available in the Q7, Q8, and Q9 models. HEVC (H.265) codec = HEVC (H.265) is a new compression codec that is used to compress video. This new codec compresses twice as much data as previous codecs, so that 4K Ultra HD video can be sent over cable and the internet. HEVC (H.265) will allow 4K/60p playback for viewing 4K sports in the future. 4K/60p will also be available on future 4K camcorders. All of Samsung’s 2018 line of 4K TVs have HEVC installed. Netflix 4K Content is currently streamed using this HEVC decoder. UHD LED Edge/Local Dimming = This combines the economy of an Edge Lit TV, with the advantages of local dimming. The picture quality, black levels, and contrast can be greatly enhanced with Local Dimming versus one that is only Edge Lit. This type of system can also eliminate or reduce halo effects, clouding, and light bleeding. Samsung calls their dimming technology Micro Dimming, while LG uses the term LED Plus. Full Array Local Dimming LED TV = An LED TV that is illuminated from the rear by an array of LED lights. These lights can be dimmed or turned off to give maximum contrast and picture quality. This type is superior to an edge lit dimming LED TV. These are hard to find, and much more expensive than the other types. For Samsung in 2018, only the Q8 and Q9 Series have Fully Array Dimming. HDMI® 2.0 Support = HDMI 2.0 is the next generation of HDMI which will provide higher framerates for 4K Ultra HD content, more audio channels, and Full 4K 3D. All of Samsung’s 2018 4K models come standard with HDMI 2.0a installed. Quad Core Processor = All of Samsung’s 2018 4K Ultra HD Lineup will have a Quad Core Processor. This will greatly increase the functionality and speed of Smart TVs, and internet connectivity. Clear Motion Rate = Clear Motion Rate or CMR works with your 60Hz or 120Hz panel to give you a better picture from fast moving action. The higher the CMR on Samsung TVs, the better. All 2018 QLED TVs have a 240 CMR motion rate. 10-bit panel = Samsung’s higher end TVs have a 10-bit panel that can display over one billion colors.